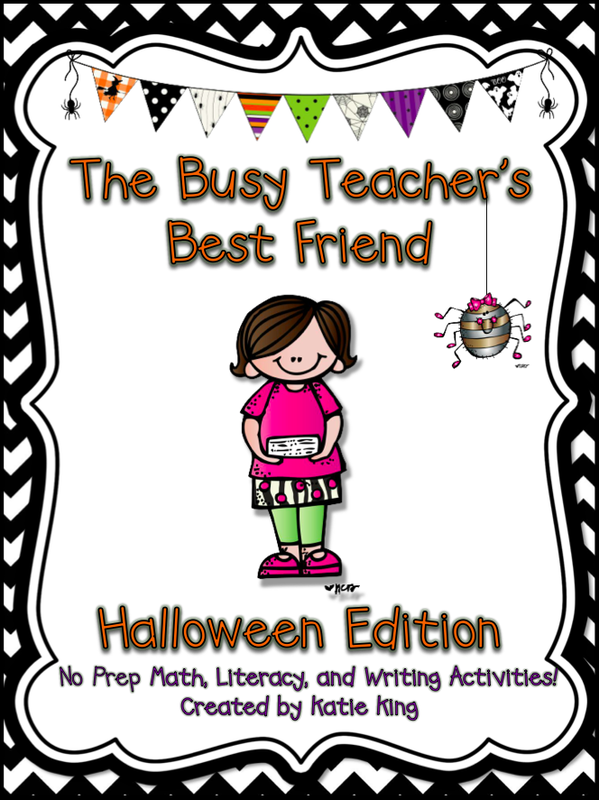 I just completed my LAST Monthly Busy Teacher! I now have Sept- Summer for Kinder, 1st, and 2nd. That is a whole lotta busy teachers! 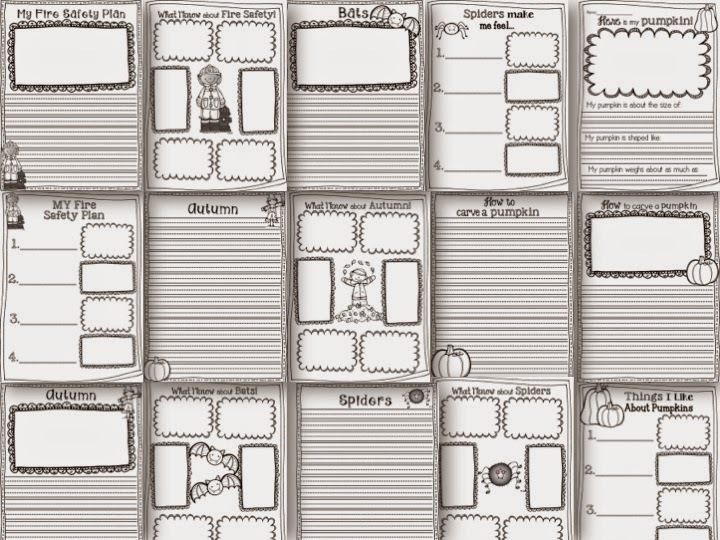 Here is a closer look at just SOME of the printables in the pack! 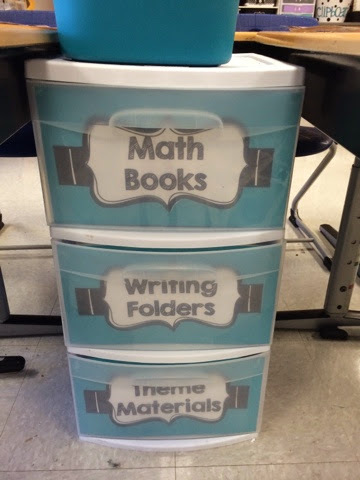 I use these pages for Daily 5, morning work, homework, and sub plans. I seriously couldn't survive without them! 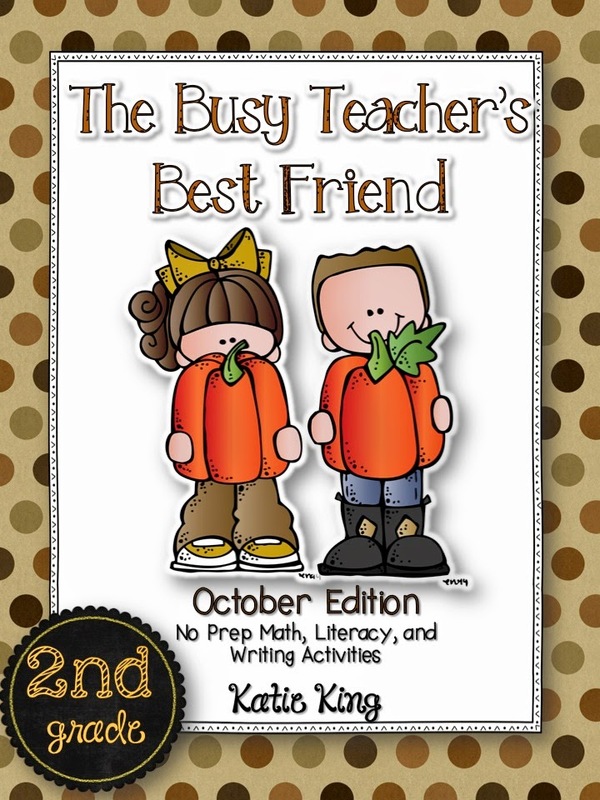 Here are the Kinder and 1st October Busy Teachers too! 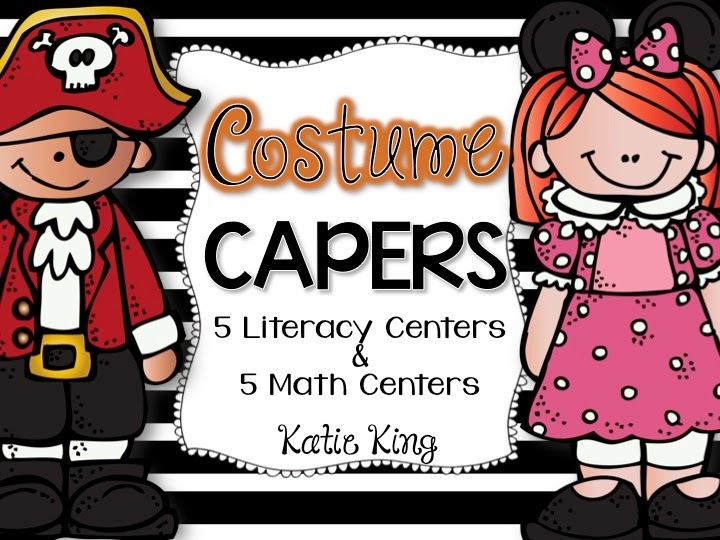 In about two weeks I will be pulling out my October Math Stations and Literacy Centers as well! 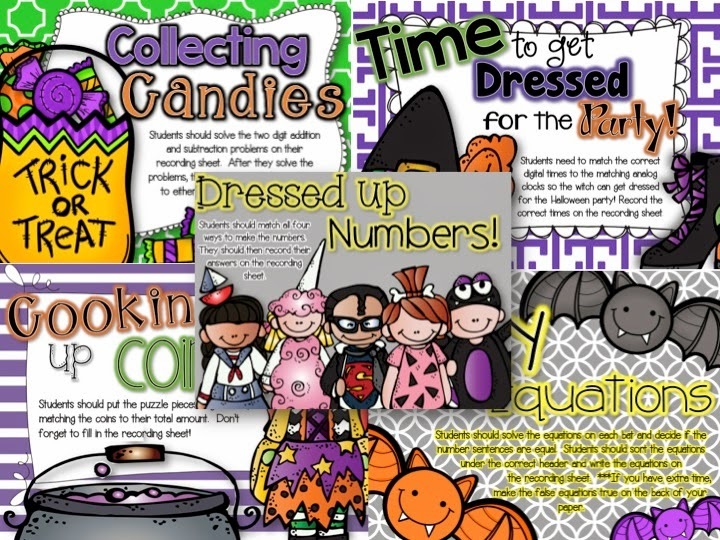 We had so much fun with these last year that I know this year's class will love them too! 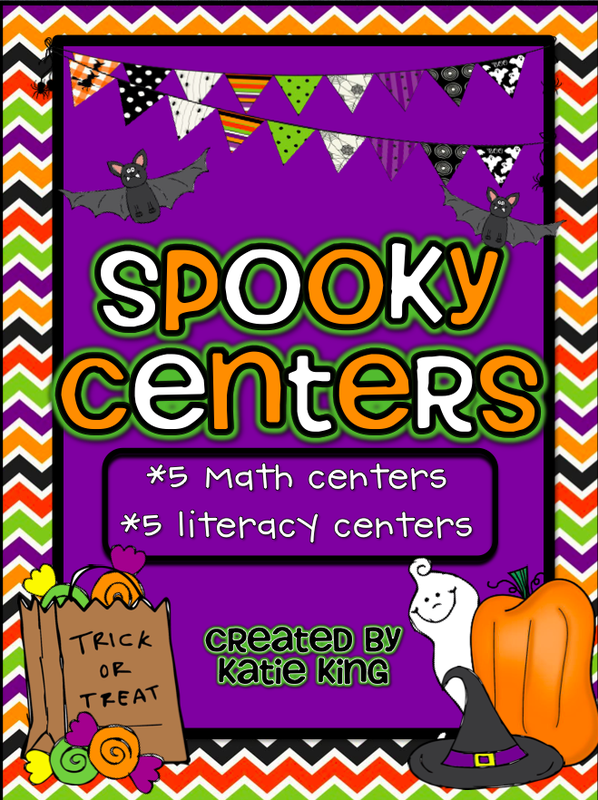 Here is my First grade set of Centers! 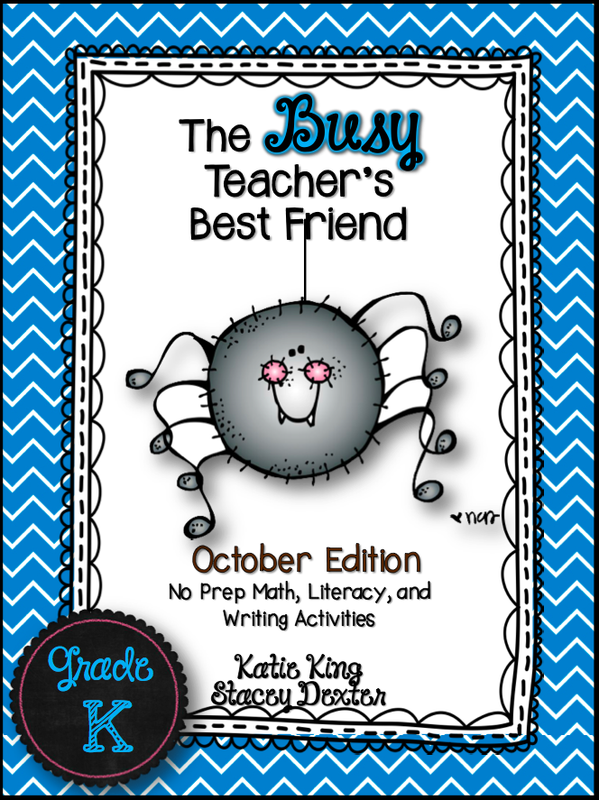 Since I am SO glad to finally have my last monthly Busy Teacher, that I put my WHOLE TPT shop on sale for 20% for the rest of the night! I hope you can find something you like! Tiger Godzilla King to be exact. What a strong name, right? Of course my kids picked that name! Ha! 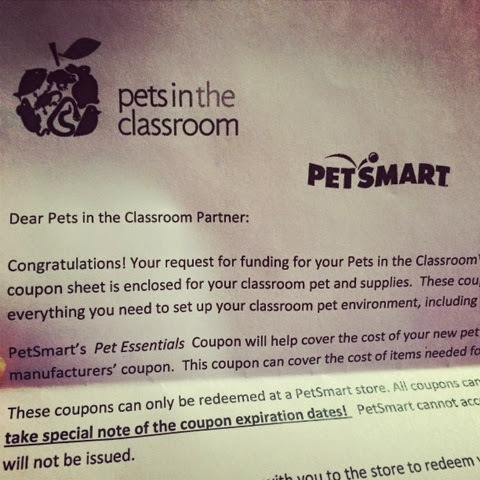 So I have been hearing about the Pets in the Classroom grant for awhile now and I finally took the leap this year! 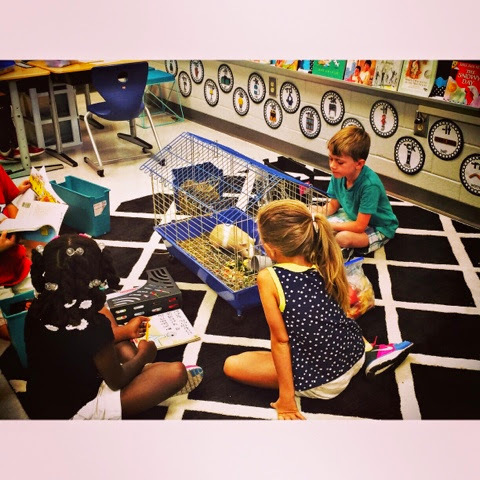 The first week of school I had my kids reading and researching the different kinds of pets we could get. Then I let them vote. 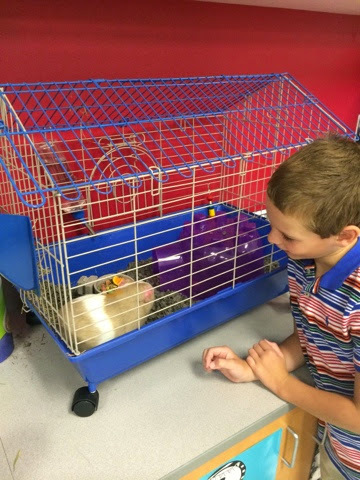 With an extremely heavy vote in favor of a guinea pig, we had our pick! I have to admit that when I walked into Pet Smart, I was absolutely stunned by how BIG the guinea pigs were. As someone who only had does growing up, I have very little experience with caged animals. I fought my nerves as found this precious guy! I actually hesitated on this particular piggy, who I now adore, because he has red eyes. I thought it would freak my kids out, but it didn't! Not in the least! 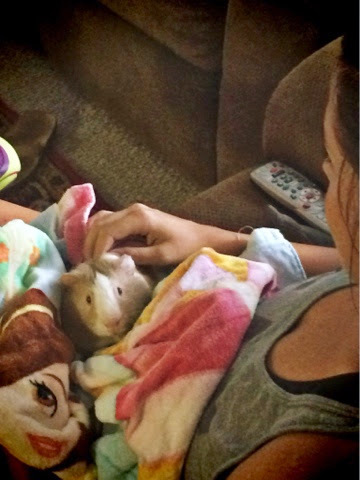 They actually said it made our guinea pig extra special! The Pet Smart employee who helped me with my selection gave me tons of useful advice. She told me to leave Tiger at home for a few days to let him adjust. This worked really well for us. I have a WONDERFUL setup in my classroom that includes a big cabinet that stretches my whole room so having Tiger at eye level is super easy! 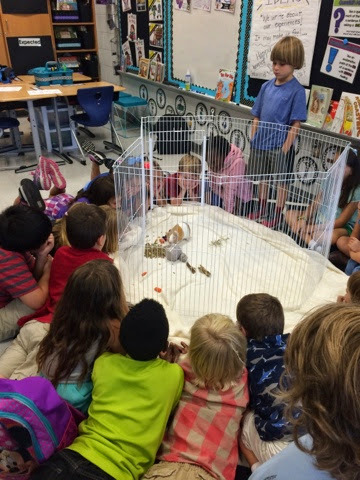 The kids are SO.IN.LOVE with Tiger. I have one precious little girl that brings a tupperware full of Kale every morning. Tiger loves Kale-- like tries to climb through the cage when he sees her. This past weekend I went back to Pet Smart and purchased this play yard for Tiger. We have specials at the end of the day so while the kids are out of the room, I can get this set up. This setup serves us all well. Tiger can run around. The kids get some Tiger time. 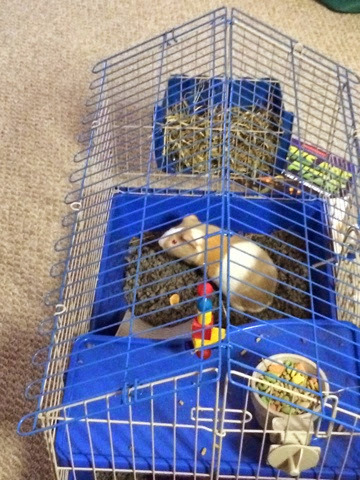 Mrs. King can clean out his cage right after school :) Lucky me! 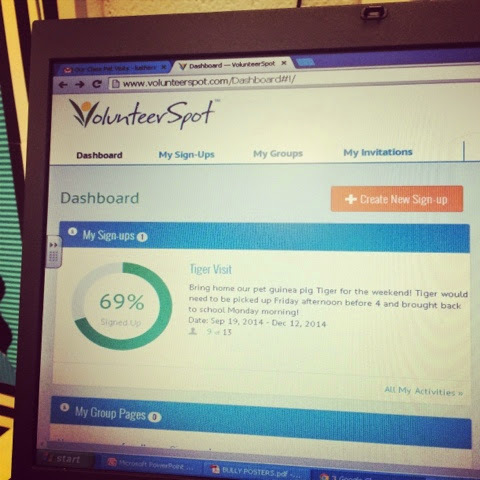 Before I go, I wanted to make sure you know about Volunteer Spot! This website is UNREAL. I was able to set up home visits for Tiger though Christmas without ANY hassle. I sent a link to my parents through a group email and that was it! So easy! 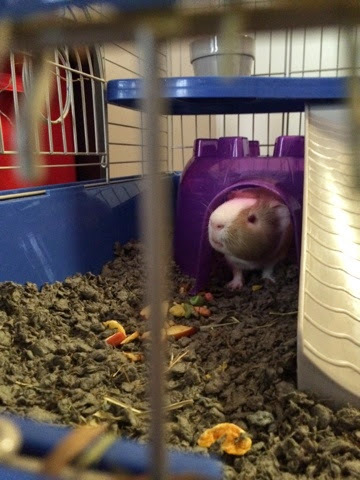 I will also use the site to add wish list items for Tiger like hay, food, and bedding, but don't worry all the essentials like Halloween costumes for the guinea pig have been purchased :). This is my second year trying out elements of Daily 5! 1. 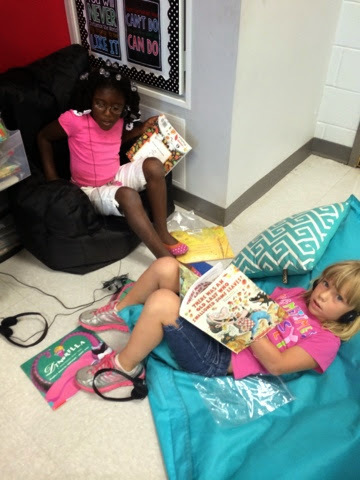 Students may work at their own pace. 2. The biggest "group" is when they are in pairs. 3. There is less prep for me. 4. Everything they are doing is QUALITY and RELEVANT to their needs/interests. Now in setting up Daily 5 I have forced myself to be patient. I have focused on one area a day, even though I am that chomping at the bit to get started! 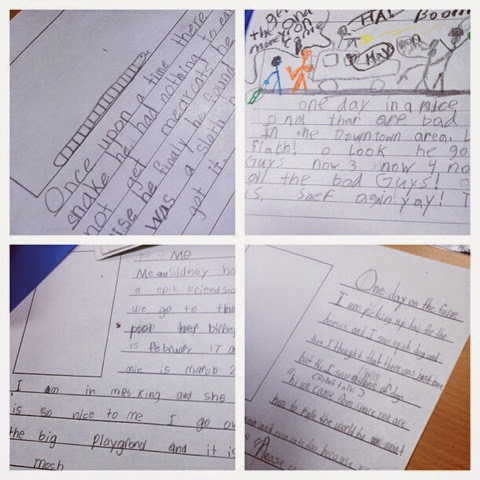 We fell in LOVE with Cara Carroll's Work on Writing packet. 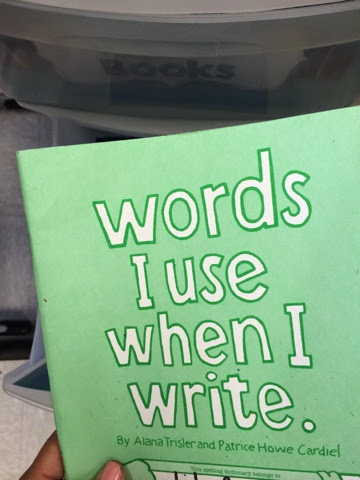 My kids LOVE to write so this is something they will love all year! Anddddd today I introduced Word Work! 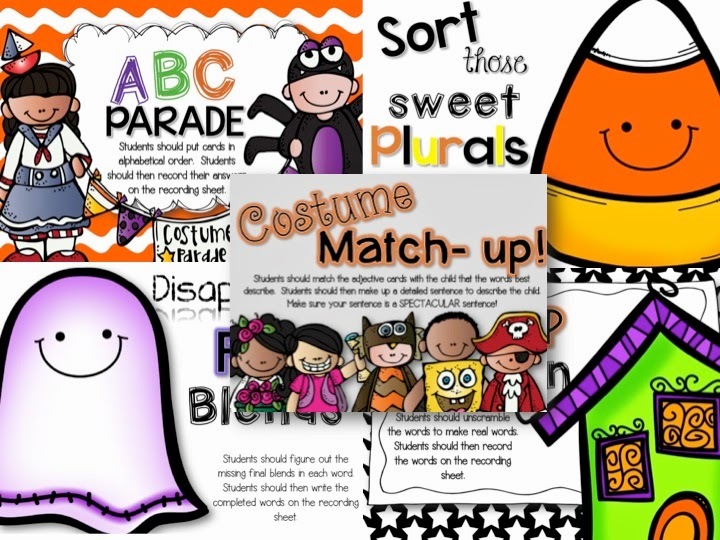 My kids can use one of my Ready or Not: Literacy Centers OR work on sight words/spelling words using fun materials seen below! 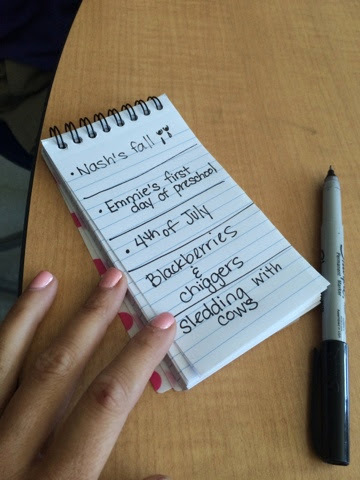 My kids have three MUST DO activities before they are released to the choice part of Daily 5. 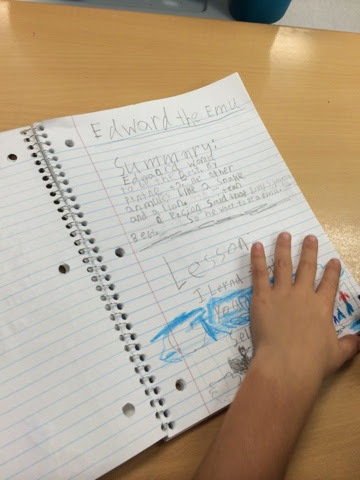 My kids write in their Reading Response books almost every day! I want them VERY used to responding to literature. PHEW! Now wish me luck as we implement the full Daily 5 schedule tomorrow! 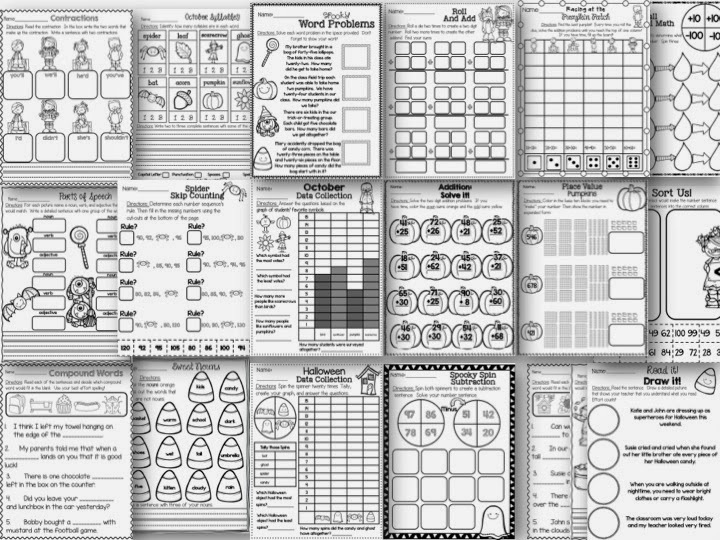 I have decided to include my posters as a freebie for you! There are also a couple of other goodies in there too! Hope you enjoy! 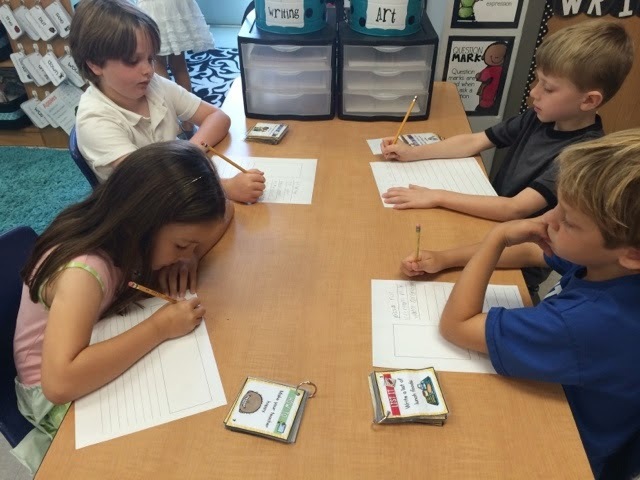 If you have read my blog for any time at all, you know I love, love, LOVE Writer's Workshop. I could list fifteen hundred reasons why I love it, but here are my top 3. 1. It gives kids a voice. All dang day kids are trying to express themselves...through chatting, playing, dancing... and we are trying to reign them in. 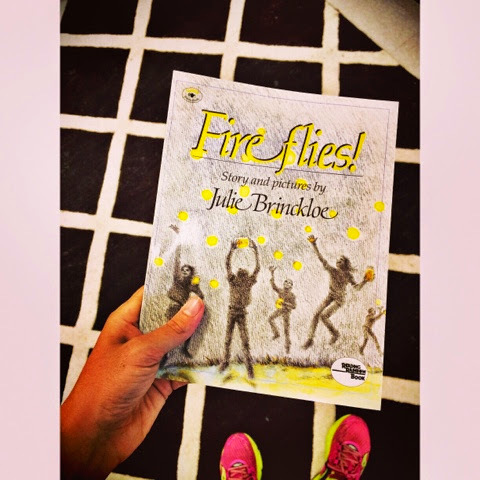 Writer's Workshop is that time where you say "Be YOU!" 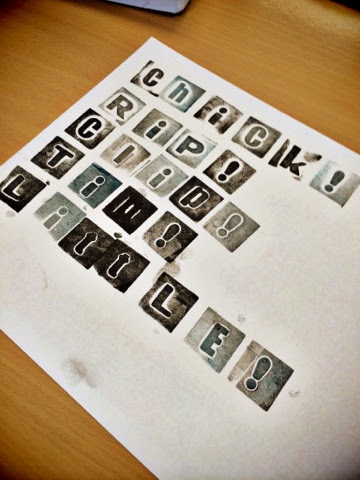 Write about what you want! 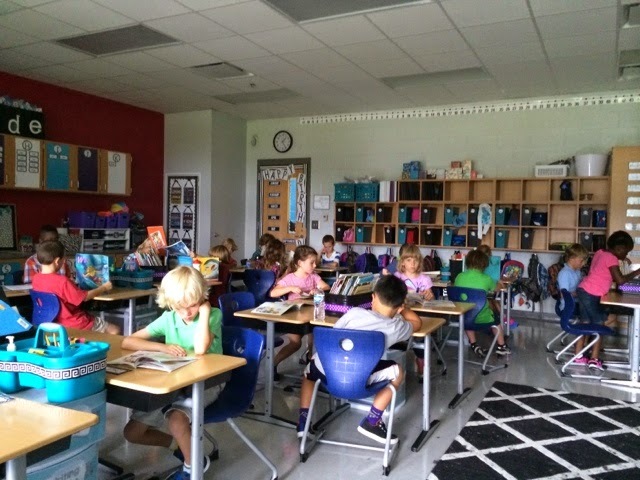 They are NOT, absolutely not responding to prompts in writer's workshop. They are taking the skills that you are teaching them and applying it to the topic of their choosing. 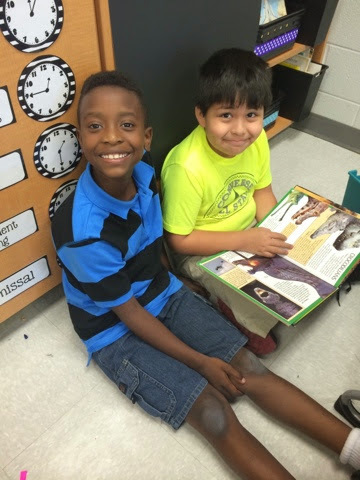 They feel empowered because they have so much control over what and how they write! 2. 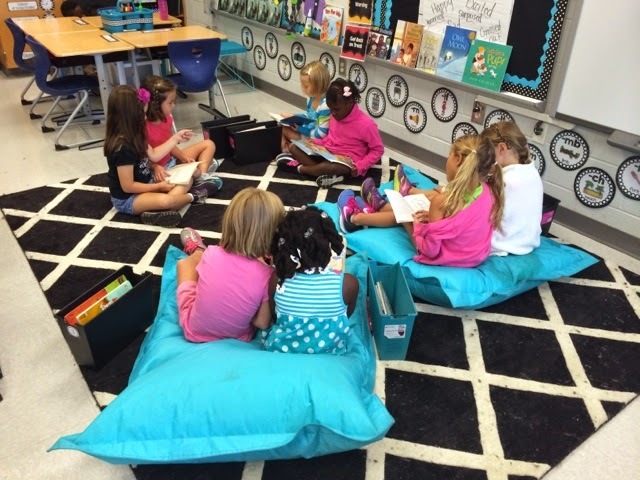 Reader's and Writer's Workshop work SO beautifully together. 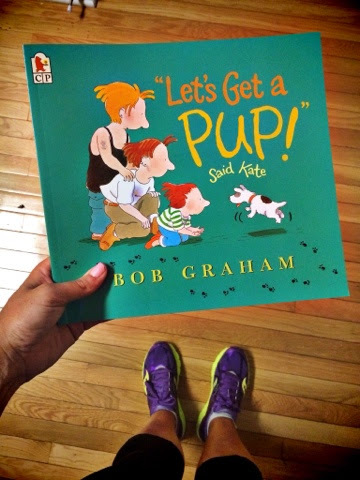 When I read a book for Reader's Workshop I talk about ways we as readers analyze the text, what gives us mental images, how it makes us feel. Then a couple of days later I pull that SAME book out and discuss how the author gave us clues, how he SHOWED us feeling instead of telling us, and how the author made powerful choices with their verbs. 3, The kids LOVE it. 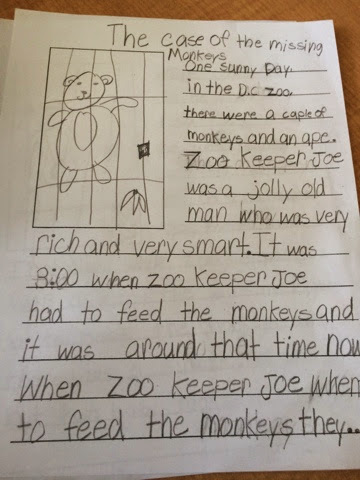 My reluctant writers become involved. My kids look forward to it. 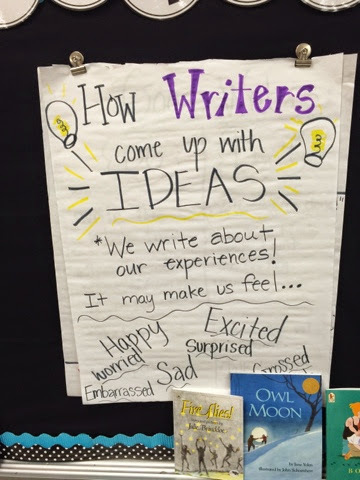 We can't wait for Writer's Workshop. They aren't scared to make mistakes. They know I won't take a red pen to their work, because I respect their art and their ownership of it. 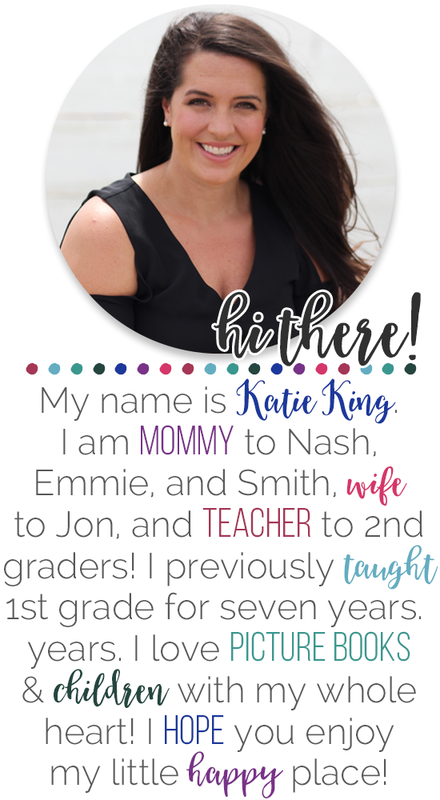 Now I can feel you saying "Okay, okay, Katie! Now what???" 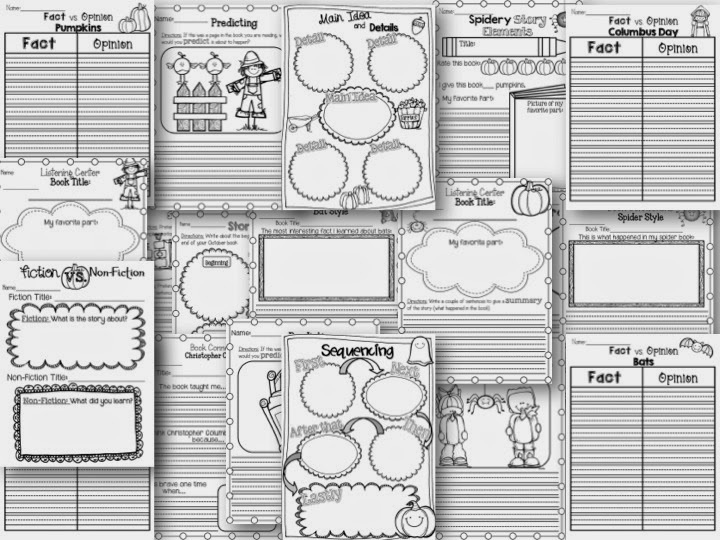 First and foremost- beg your principal to buy you Lucy Caulkins Units of Study for your grade level. Next step INUNDATE your students with quality literature. Then focus on setting up your workshop. This is the first year that I didn't jump into a unit of study right away. Instead my students wrote about whatever their hearts desired, just to get used to the format of workshop. They wrote, and wrote, and wrote! 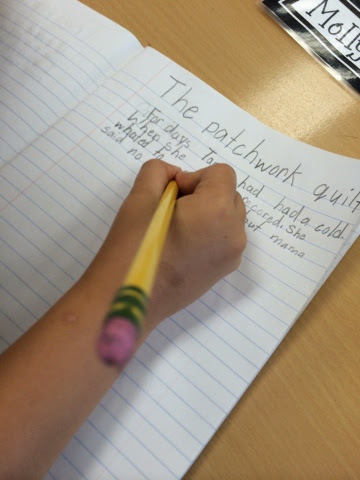 I have never had kids so excited for workshop.... kids were writing non-fiction pieces, mysteries, narratives...you name it, they wrote it! 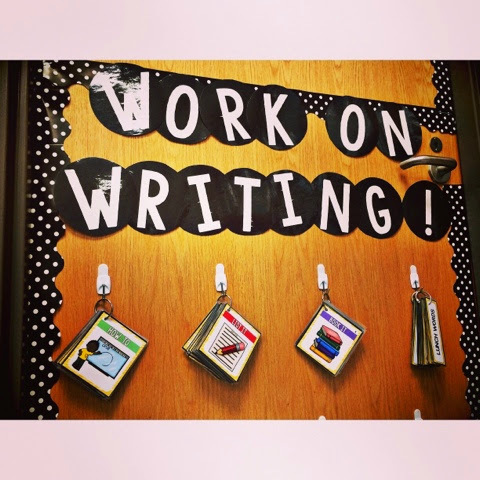 I have made a lot of changes in how I am running/organizing Writer's Workshop this year! 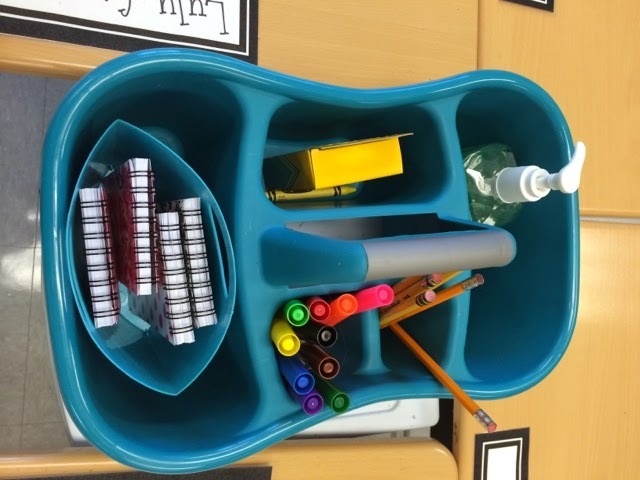 I have decided to keep all our writing tools in one spot for each table. In this draw we keep our actual folders and little student dictionaries. See below! 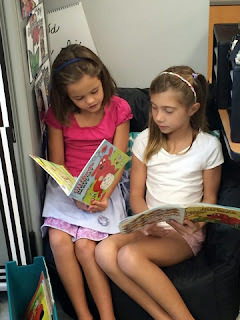 These books are provided by my school and travel with our kids to each grade level. 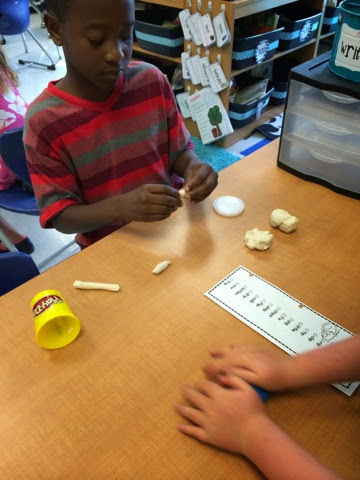 They have sight words and any other words that they add. 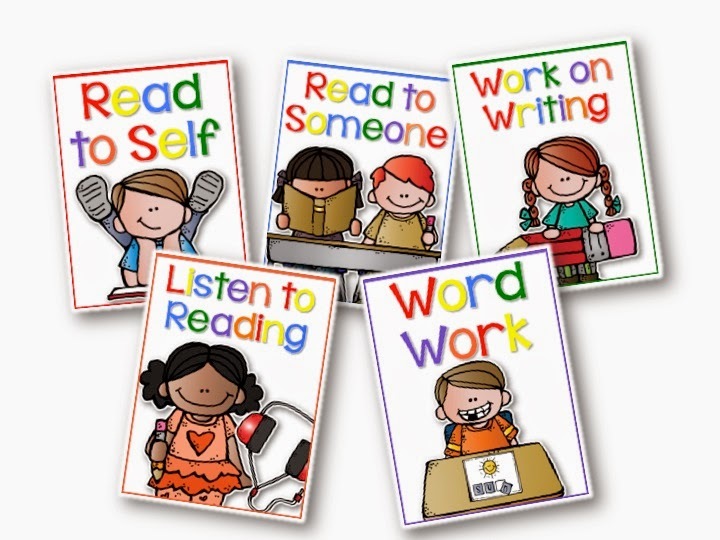 These are important for my kids, because I don't spell for them. Period. 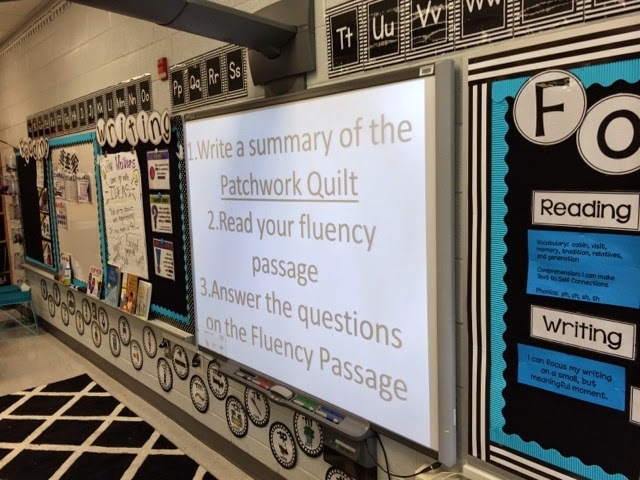 I do not want my students in a line waiting for me to spell for them OR dependent on me. 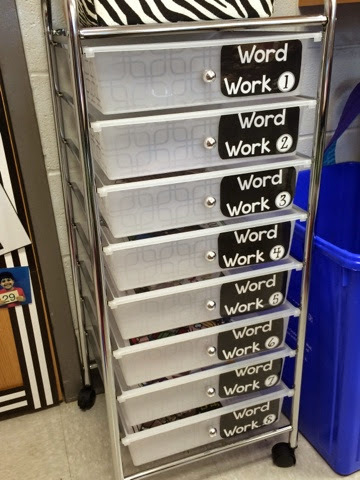 I want them to use what they know about sounds to stretch words out OR to use the word wall. 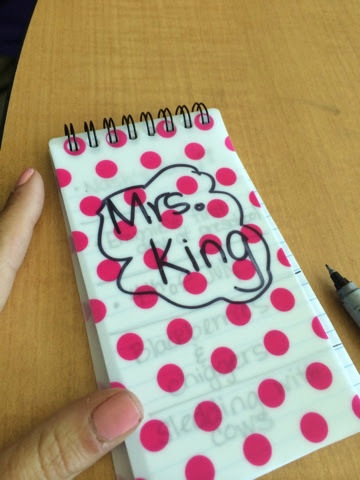 Here is my Tiny Topics Notebook. I use this to list ideas for my Narratives. My kids each have one of their own. They were THRILLED to get them! We keep them in our caddies so we can grab them whenever we have an idea to write down! 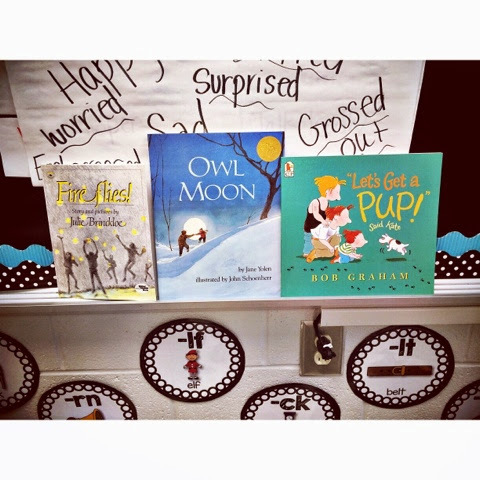 Here is a peek at the books that I will constantly reference throughout our narrative writing. I will share more with y'all and my kids soon! 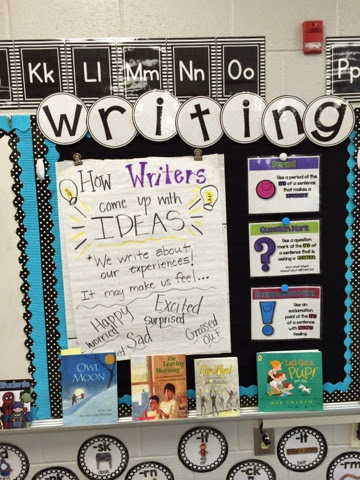 Here is a look at what my Writer's Workshop board looks like for school this week! The punctuation posters are from my Convention Camp post in my TPT store. If you take just ONE thing from this post, than I spent my Monday evening well! Good night friends!